Poodles come in different sizes, and they also come in different dog colors! Their colors may be apricot, black, blue, brown, cafe au lait, cream, gray, red, silver or white. We had one of the black toy poodles who was mostly black all over! She was supposed to turn into a silver color, but it never happened! When she was a puppy, she had silver on her chest and on her paws, but as she grew out of puppyhood she lost that lighter color. The silver in her black was one of the reasons my mom chose her, she stood out from the litter! The apricot poodle is a cream color with just a tint of red to him. Black poodles are a deep, rich color. Their eyes are usually dark like their coats. Holly's eyes looked black at times and blended with her fur! Black dog colors are a popular choice color for pet owners. Blue poodles are not a sky, royal or dark blue color! It's really a faded black color or like a black coat with a bluish tint. The blue puppies are actually born as black pups and begin to change color between the ages of 1 and 2. Like black dogs, they will also have dark brown eyes. Brown poodles are usually medium to dark brown in color, they are not a light brown color. Brown dogs will also have a brown nose. There are also light brown poodles who look like a tannish cream color. A brown toy poodle puppy is a cutie! Cream colored dogs look like an off white color. They are light, not tannish colored. A gray poodle can be born that color or the pups can be born black and turn gray around age 4. This is not a light gray color, more of a charcoal gray. The dog may also have silver colorings mixed in with the gray especially in the leg area. Red poodle puppies are not a bright red! They are a darker version of the apricots. They appear to be a cinnamon color, auburn color or a burnt orangish/reddish color. Cafe au lait colored cuties are a light brown color, not as rich as the chocolate brown ones are. Silver poodles are very cute! These puppies are born as black pups and begin to change color in their faces and paws their first few months of life. These cuties usually have dark brown eyes. White dogs are another popular choice for poodle lovers. They are a cloud white color. A phantom poodle is bi-colored. A light color is above their eyes and on the nose, throat, legs, feet and tail area. Color combinations vary and include black with apricot, brown, cream, gray, red or silver, or brown and red with apricot or cream. 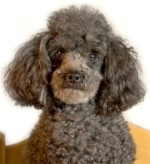 A standard parti poodle also has a two color coat. He can be white and black, brown, blue, silver, red or apricot. The dog colors make for a nice choice when prospective pet owners are looking for a loving addition to add to their family.